A little over a week ago, news sites, blogs, and twitter lit up with the news that Matthew Vaughn’s X-Men: First Class, produced by Bryan Singer, will be set in the 1960s. 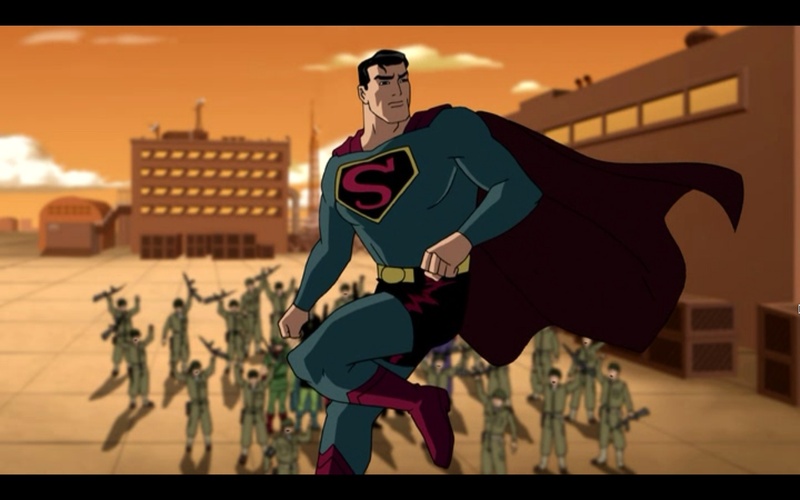 Though there is a long history of popular comic adaptations evoking the aesthetics of a bygone era: Batman: The Animated Series famously used art deco and 1940s film noir as its visual guide; Richard Donner’s Superman films, Singer’s Superman Returns, and Superman: The Animated Series all hark back to the 1940s and early 1950s in their clothing and sets, but all these examples were clearly set in the contemporary period with the technology to go with it. Few details accompanied that news, but producer Bryan Singer made it clear that the 1960s culture will be an integral part of the film, mentioning historical figures like JFK and Malcolm X as well as saying that some part of the action will occur in the U.S.S.R. While most opinions I’ve seen offered on this praise the decision to return to X-Men‘s Silver Age roots, especially in terms of aesthetic and mutant-as-allegory, I’m intrigued by the return to the height of the Cold War, sure to play a vital role if scenes are indeed set in the U.S.S.R. 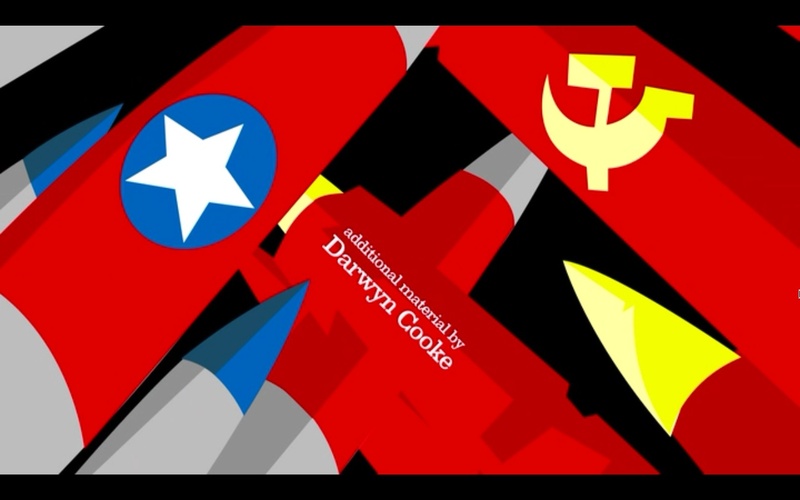 In particular, I’m curious if this is to be a trend as one of the better-reviewed DC Animated straight-to-DVD features was also set in this Cold War era, Justice League: The New Frontier. Are these superhero comic adaptations merely riding the wave of the 1950s aesthetic exemplified by Mad Men‘s cultural capital? Or is there something else undergirding this possible trend? Though, as Noel Kirkpatrick replied when I first floated the question on twitter, Matthew Weiner may take credit for the upswing in early Cold War popular culture settings, The New Frontier addresses the tension in a much more overt but no less complicated manner than Mad Men does. Hal Jordan, who will become the Green Lantern by the third act, is introduced as an American fighter pilot at the moment of the Korean War’s cease-fire who is shot down and must kill a young soldier to survive. That moment of guilt and survival, wrapped around a truly needless death–he keeps telling the boy that the war is over, but the language barrier is insurmountable–sets the tone for both the character and the film. Hal is a character born of an unsanctioned battle. The war is officially over, but it continues in the trenches between one soldier who knows of the official cease-fire and another soldier who cannot understand. The New Frontier delves deeply into the tension between the sanctioned and unsanctioned battles that speak to the Cold War sensibility. One of the major tensions among the heroes before the appearance of the villain (the Center), is the idea of superhero registration and complicity in McCarthyism. Certain heroes agreed to work for the United States government while others refuse to do the dirty work of the late 50s/early 60s Cold War. Both sides are portrayed as equally fraught: Those who refuse to give up their individualism are labeled as vigilantes, but those who agree to conform lose some of their fundamental heroism by perpetuating an Us vs. Them mentality rooted in the Red Scare. This tension between the push for conformity and the desire and need for exceptionalism is one of the key tensions of the era (and why I chose to title my post after the book and film The Man in the Gray Flannel Suit). Superman is the Company Man in this feature, and I’d argue that’s why he is largely absent for the main battle. In addition to making way for the DC heroes that haven’t had as many adaptations–Flash and Green Lantern in particular (and I must wonder if this is due to wheels in motion for their respective live-action features, the former still in development purgatory)–injuring Superman to the point that he is assumed dead for most of the battle perhaps serves as a punishment for his conformity. Certainly, it is curious that he is returned to the screen and saved by the appearance of Aquaman, a DC superhero who in the Animated Universe, can be portrayed as an outsider and even political separatist (often choosing Atlantean needs over American ones). If Superman is the man in the gray flannel super-suit more than the Man of Tomorrow in terms of conformity, Green Lantern appears to be the superhero to tackle the ever-present–but increasingly discussed in the 1950s–crisis of masculinity. Hal deals with having to kill a young soldier by removing himself from the military and moving toward the private sector, yet he refuses to kill after his initial moment of violent survival. As a result he acts against the label of “coward” that he faces due to his pacifist streak. The dichotomy is set: to be a true man is to be willing to kill among his peers. However, it is his respect for all life that draws the Green Lantern ring to him and grants him the true power of the Lantern corps. Hal still performs a rather hegemonic masculinity: virile, powerful, and heterosexual; however, he advocates for gender equity and doesn’t let the homosocial pressure to do violence sway him. He represents a shifting idea of desirable masculinity, moving away from War Hero masculinity of WWII and entering into the more ambiguous proving ground of the Cold War. Using the early Cold War era in recent superhero comic book adaptations capitalizes on the fashionable trend of the time period and Silver Age nostalgia, but it also provides a setting defined by its contradictions–and to a degree the narrative of its lack of contradictions–providing ample ground for allegorical readings and contemporary meaning-making. 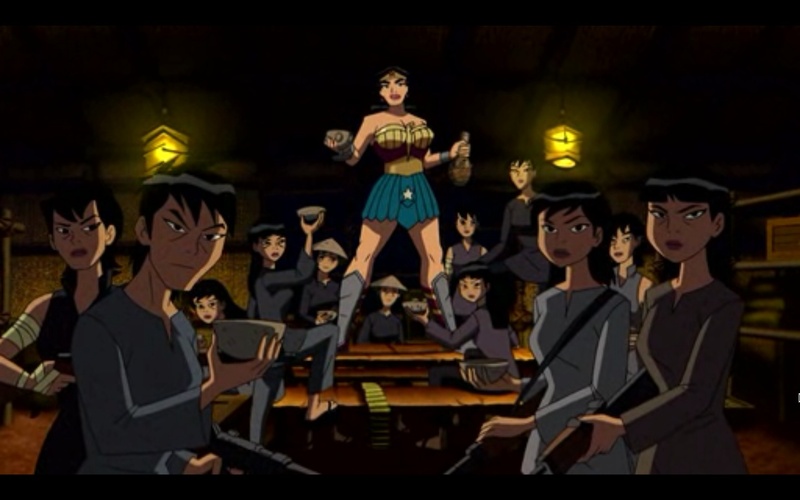 Wonder Woman says: be(a)ware the consequences of providing arms to proxy warriors.